Scrutiny: Shilpa Shetty Kundra honored at the Brand Vision Summit! Shilpa Shetty Kundra honored at the Brand Vision Summit! Shilpa Shetty Kundra ,who already has a successful yoga dvd to her credit , went on to pursue her passion for wellness and established the highly successful "Shilpa Shetty Channel" , a one-stop-shop for fitness enthusiasts across the globe. Last year ,she also turned author with her award winning book ,The Great Indian Diet .The health and fitness book topped Amazon's bestseller list and continues to remain one of the highest selling books in the health segment. The Wellness entrepreneur now announces her second book , interestingly titled "The Diary of a Domestic Diva" and continues to remain one of the most popular brands in the health and fitness space, not to mention, one of the most loved faces on television. Shilpa Shetty Kundra was today awarded for her achievements at the Brand Vision Summit for having extraordinary brand connect. Brand Vision is now in it's third season and has garnered immense love from it's audience owing it to the mix of personalities and companies from the fields of business, entertainment, sports, art & literature, philanthropy & media which are glorified at the Brand Vision podium. 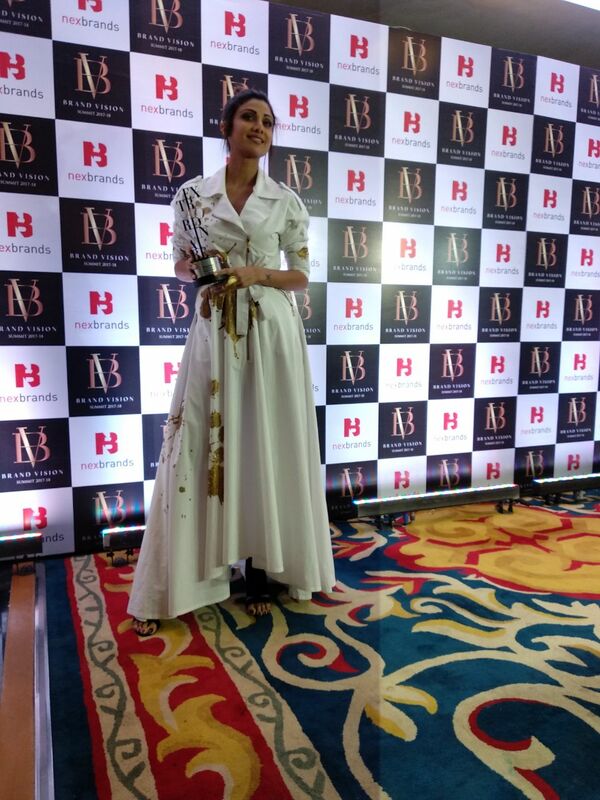 On receiving the award said Shilpa, " Really excited to receive this award. This is truly encouraging".